Jen (aka doinkies) is a little doink (but not as little as before!) who lives in a small town in California, and she's currently getting through high school and studying Japanese and Spanish at a small college. 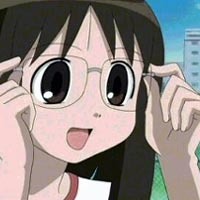 She got into anime in 1999 by watching Sailor Moon and Tenchi Muyo on Cartoon Network, and has watched quite a bit more since then, a large proportion of it shoujo. She has been following THEM since 2000 and registered on the second version of the THEM Boards. Now she is registered on the new version and is a reviewer, particularly of obscure shoujo anime (although she does review other stuff from time to time). She does in fact refer to herself as "doinkies" (in the third person). You get used to it after a while.